David Altimira from HitLab NZ is visiting the Exertion Games Lab for 1 week, and as part of this, he is giving a talk about HitLab NZ and his research there. In particular, he is interested in getting feedback on his current PhD on Exertion Games. Exertion games introduce engaging elements from traditional games to physical activity routines. They can help to encourage people into doing more physical exercise and therefore bringing the mental, health and social benefits. They have become popular due to the latest generation of gaming consoles which support more natural input. However, there are few theoretical frameworks or models for designing “good” exertion games. The goal of this PhD research is develop theoretical guidelines that can be used to easily develop effective exertion games. These guidelines will be developed by exploring the interrelationships between game and user experience within the context of sports focusing on (i) balancing play between people with/without disabilities in order to make the play more engaging and (ii) social play minimizing the negative effects associated with crowding, social pressure and shyness. Several prototype games will be designed based on these guidelines and user studies conducted to valid the model. David is a doctoral candidate at HIT Lab NZ and and his research interests are exertion interfaces, in particular exergames, full body interaction, gaming in general and computer vision. David studied Computer Science at the Universitat Pompeu Fabra in Barcelona where he also completed a master of Cognitive Systems and Interactive Media. 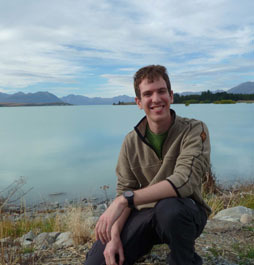 In 2010 he went to Chicago to do some research in the Learning Technologies Group within the University of Illinois at Chicago’s Electronic Visualization Laboratories and in 2011 he did an internship at the HIT Lab NZ, where he started working with Kinect. In his spare time David enjoys doing any kind of sport such as basketball, tennis, running, swimming or biking and he likes to be in contact with the nature and do some hiking.